Though it’d be incorrect to call these two new releases by drummer Antonio Sanchez a followup to his score from last year’s Oscar-winning Birdman, it’s impossible not to consider this new work alongside the film music. That score comprised unaccompanied, improvised trap solos. Both Three Times Three and The Meridian Suite present ensemble music that is composed (to various degrees): The former still emphasizes improvisation and musical contrast, while the latter is more through-composed and holistic. Both are excellent. Three Times Three, a double-disc, derives its name from its use of three different trio configurations. One puts piano (Brad Mehldau) out front, one guitar (John Scofield), one tenor saxophone (Joe Lovano). 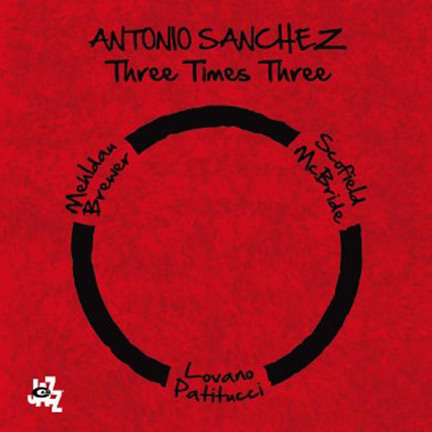 Each band uses a different bassist (Matt Brewer, Christian McBride and John Patitucci, respectively), and each plays a different set of two Sanchez originals and one cover. As the leader and only constant, it stands to reason that Sanchez represents the album’s musical centerpiece. But his self-presentation is much more clever than that. Because the trios appear in the sequence listed above, the album gives increasing freedom and space to the drums. On Miles Davis’ “Nardis” (here titled “Nar-this”), Mehldau, with his heavy touch and lush harmonies, dominates the shape of the music even when Brewer or Sanchez is soloing. Scofield’s thinner chords and playing widen Sanchez’s berth, and even when he dons rock-ish distortion on the funky “Nooks and Crannies,” he’s mainly accenting Sanchez and McBride. By the time Lovano arrives, his sax is just another layer in the rhythm section. On “Leviathan,” Patitucci sticks to figurated lines while Sanchez reconfigures the groove and tosses off brilliant asides. Three Times Three is a step removed from the Birdman score-another spotlight for Sanchez, with accompanists to provide ever-lightening parameters. That cannot be said of The Meridian Suite, an exploration of the abstract, intersecting lines that structure one’s life, and one of the most cogent and compelling longform jazz pieces to come along in quite a while. This one employs only Sanchez’s working quartet, Migration: Seamus Blake on tenor and EWI, John Escreet on piano and Fender Rhodes, Brewer on bass. (Guitarist Adam Rogers and vocalist Thana Alexa are also featured.) Its composition is so extensive that its five lyrical tunes feel like movements in a symphony, with little space in between and recurring elements throughout. (In the most obvious example, both the second and final movements reprise the 5/4 piano ostinato of the opener, “Grids and Patterns.”) It’s also hard to tell where the writing stops and improvisation begins. A Blake solo on “Grids and Patterns” feels like improv in its linear melody and shifting syncopation; but after a few bars, Rogers begins doubling him, without the line changing character. There’s a freeform workout on “Magnetic Currents.” Tellingly, it’s the shortest track by far. In other words the writing, rather than any individual musician, takes precedence. Even Sanchez doesn’t dominate. He gets his bravura runs in, on “Channels of Energy,” but they compete with Escreet’s overamplified Rhodes and a strong melody voiced in unison by Alexa, Rogers and Blake (on EWI). Of the two, The Meridian Suite commands more attention; however, they have a distinct power in tandem. And again it’s impossible not to compare them to Sanchez’s prior work on Birdman. Taken together, they form a splendid triptych of his music.